The United States printing inks market is expected to amount to 1,120.30 thousand metric tons by volume and USD 5,393.46 million by revenue in 2017 and is expected to register an estimated CAGR of 4.90% and 5.45% respectively, during the forecast period, majorly driven by the growing demand from the digital printing and the flexible packaging industry. Currently digital printing accounts to only around 7% of the total United States printing inks market. This industry is expected to grow at the fastest rate in the coming years. The growth of the textile industry coupled with revolution in fashion industry and rapid adoption of digital printing against conventional printing is driving the growth of printing ink market in United States. Additionally, the market for digitally printed books is also expanding rapidly. Text books can be tailored to the students, novels to readers, and business messages to the targeted audiences. Packaging application has dominated the United States printing inks market, accounting for more than 45% of the total market share in 2017. Innovative product packaging are also becoming successful in dragging the consumer’s attraction in homecare, food, and soft drinks industry. This is also supporting the packaging industry growth. Increasing trend of hard bond books in the United Sates is also expected to drive the United States printing inks market during the forecast period. 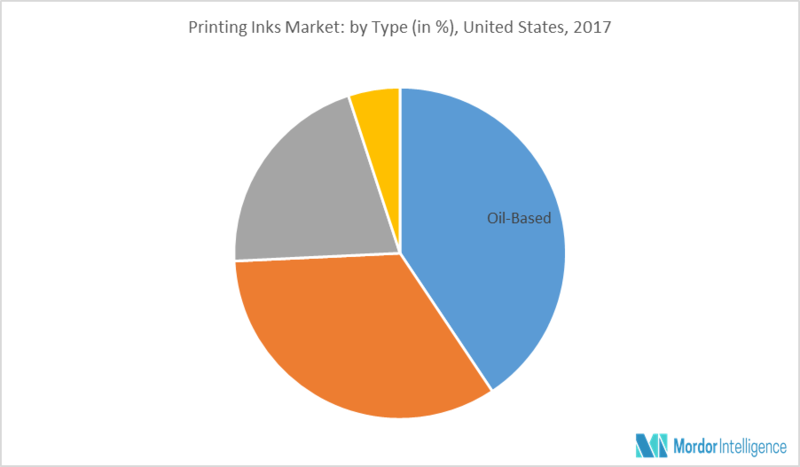 Oil based printing inks has the largest share of about 40% among type in the Unites States in 2017. Water based printing inks are rapidly replacing oil and solvent based printing inks which has toxic and hazardous nature. The main driving force for the usage of water-based inks is to completely remove hazardous chemical from ink, not just reduce the VOC’s that are present. Water-based inks excel in printing applications involving paper, cardboard, and textiles, are even used to print on foils, plastics, and food packaging. These printing inks are used majorly in flexographic, gravure, and printing processes. Major Players: Flint Group, Sun Chemical, INX International, Siegwerk and Quad Graphics Inc., among others.